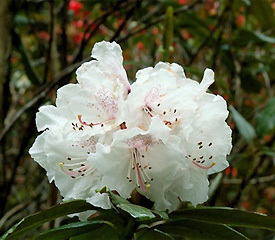 Flower/Truss Description: Campanulate or funnel-campanulate, white, often flushed pink, spotted red. Inflorescence 6-12 flowered. Foliage Description: Leaves elliptic to broadly ovate, up to 7½" long, thin brown indumentum.